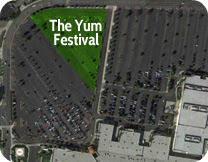 Chronicles of a Foodie: Upcoming Event: The Yum Festival! Upcoming Event: The Yum Festival! Are you ready for some FOOD TRUCKS?! I am and I'll be at The Yum Festival this weekend! This second annual foodie fest is taking over the Ontario Mills Mall with over 20 food trucks this Saturday, September 29th from 2PM-8PM so come early, or late, but just come and enjoy some great food, music and giveaways! If you're familiar with the Ontario Mills Mall, the festival will be taking place across from the Fuddrucker's and Carl's Jr. For all newbies to the area, this means the corner of Mills Circle and Gumee Avenue (see map below). Presale tickets are only $5 online right now, but will be $7 at the door! Just to clarify, this is an entrance fee, you'll still have to purchase your food from the trucks separately! Hope to see you all there!